Dennis Gibson is best remembered by Charger fans as being the savior of the team in the 1994 AFC Championship Game, when he blocked a TD pass from Steelers’ QB Neil O’Donnell in the endzone to win the game. The play propelled the Cinderella Chargers of 1994 into the SuperBowl- their only SuperBowl appearance to date. A home grown Iowa product who went to school at none other than Iowa, Gibson went to the bright lights of the city of cars and industry, as Detroit took him in the 8th round of the 1987 draft. Considered a budget find, Gibson stepped right in and contributed almost immediately, and later went on to play beside both Michael Cofer and Chris Spielman at right inside linebacker for the Lions 3-4 alignment. Gibson also appears alongside his teammates in the classic football game Tecmo Super Bowl. 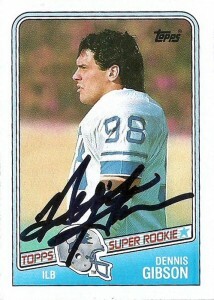 He saw some of the better glory days of the reborn Lions under Wayne Fontes and started 7 seasons for the Lions defense. In 1988 Gibson had a career high 116 tackles, and in an injury shortened 6 games in 1989 he recovered 3 fumbles. He’d sign with the Chargers in 1994 and play there through the 1995 season before retiring. At last glance in 2013, Gibson runs Encore Pizza in near obscurity outside of Des Moines, Iowa.